I would’ve thought it’s self-evident that you shouldn’t physically attack anybody for what they say, even if they disagree with you, but a lot of people seem to think it’s fine. They’re condoning two recent acts of political violence. Gianforte then “grabbed Jacobs by the neck with both hands and slammed him into the ground behind him,” according to Fox News reporter Alicia Acuna, who was also in the room. This account was corroborated by BuzzFeed reporter (and my former officemate) Alexis Levinson. I believe her. I’m not going to claim I’m a fan of Ben Jacobs’ work, but this is disgraceful. Gianforte needs to be held to account for it. Lucy Usoyan doesn’t remember all of the details of the brutal beating she suffered at the fists and feet of a group of men in front of the Turkish embassy in Washington, D.C. last week. But after being being showed a picture of Eyup Yildirim on Wednesday, she says that the 50-year-old supporter of Turkish president Recep Tayyip Erdogan was one of the goons who savagely kicked her while she was curled up in a ball during the melee. 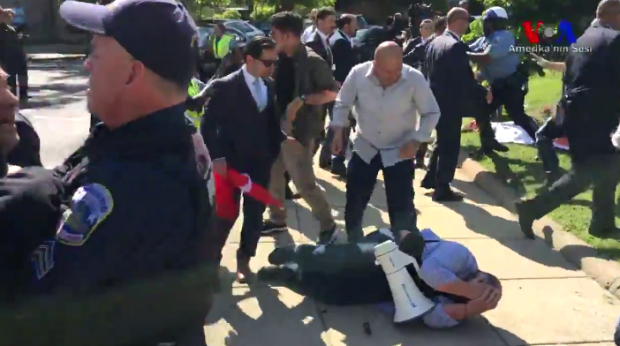 Completely bald and wearing a white shirt, Yildirim joined dozens of other Turkish men in a full-frontal assault on a group of peaceful Kurdish protesters gathered outside the embassy. The police need to have a little chat with Mr. Yildirim. Whether you’re a congressional candidate, or a supporter of a fascist dictator, or anybody else, you don’t get to beat people up for disagreeing with you or criticizing you or otherwise challenging you. And that’s true whether the victim is Ben Jacobs or Lucy Usoyan or Richard Spencer. Or me. Or you. Or anybody. This isn’t a liberal or conservative thing. It’s just common decency, and common sense. Unless you’re physically defending yourself, keep yourself to yourself. I’m told this makes me a weakling and a cuck and so forth. So be it. Wrong is wrong. P.S. Albert Rosenfield was right.